I recently came across this essay from Chez Panisse alum Tamar Adler’s new book, An Everlasting Meal: Cooking with Economy and Grace. I think the opening line really sums up an excellent life rule: “A salad does not need to be a bowl of lettuce. It just needs to provide tonic to duller flavors, to sharpen a meal’s edge, help define where one taste stops and another begins.” The entire essay is worth reading, especially in these upcoming months when our summer tomatoes are a distant memory. Root vegetables, Ms. Adler reminds us, can do much more than serve as a warm starch on the side of a plate. Of course, root vegetables require a little more work than summer veggies. Beet preparation in particular, I have discovered by trial and error, can be a messy, messy undertaking. As much as I love steaming, pressurizing, and grating the root, the collateral damage of peeling – garnet-stained hands – can be frustrating, especially when hosting dinner guests. 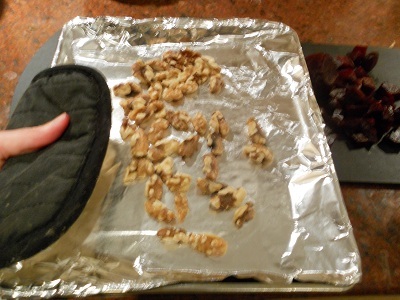 As a result, roasting has become my go-to beet prep method; it is the easiest, cleanest and tastiest method. At least that’s what I’ve come to believe, anyways. I think I’ve mentioned this before, but as the Suzuki method has taught us, if I catch you early enough in your beet journey, and with constant repetition, you, too, can be a beet maestro. If you’re ever at home for more than an hour, crank up the oven to 400. Fully wrap each beet in a piece of tin foil, place them on a baking sheet to prevent drips onto your oven floor, and roast away. Beets are very low-maintenance, so now you’re free to do whatever you want. My own tastes run towards petting the cat, reading library books, and/or catching up on the latest news via Perez Hilton – or, um, I mean, working out. 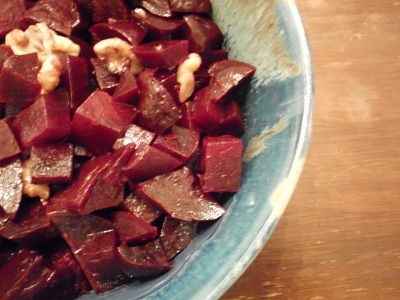 At around the 50 minute mark, test your tin-foiled beet by sliding a fork into it. If the fork does not easily slide in and out, give your beets another 10 minutes and test them again. Repeat this method until the fork pierces the beet with little to no effort, then remove from the oven. Once the beet is cool enough to handle, open the foil, head on over to the sink, stick the beet into a stream of running water and rub off the skin. It will be quick and clean, but make sure to wear an apron, just in case. And turning your beets into an Adler-esque salad is almost as easy as roasting them. Just toss them with a quarter cup of roasted nuts and a drizzle of vinegar and olive oil. The only real work involved in this dish is making sure your nuts don’t burn. Think 325 for about seven minutes, with an eagle eye and the nose of a bloodhound. I usually toast my nuts in the toaster oven my friend Brian bought me with his Jeopardy winnings. This blog post and ridiculously simple recipe was in support of Sweet Local Farm’s Home Grown Food Challenge. For nearly 10 years now, my friend Dan has traveled the world. First there were several years of Peace Corps in Ukraine and Uzbekistan, then a stint backpacking through Southeast Asia. After a pit stop at Harvard’s Kennedy School of Government, he’s now working with Burmese refugees in Thailand… I think; it’s hard to keep track. Along the way, Dan has sampled some Fear Factor-worthy delicacies: crickets, cockroaches. He tells a story of a sheep that had the misfortune of ramming his host mother. In response, she killed it, made it into soup, and served it to Dan for lunch. So I was a bit surprised at Dan last summer when we attended a neighborhood BBQ. He went a little gaga for the three-bean salad. It started out innocently enough: a small serving on his paper plate next to a hot dog. And then he went back for seconds, and then thirds. He spent a good chunk of the afternoon lingering by the bowl, as though he was guarding it. At some point, I pulled him aside and said, “Dan, it’s three bean salad. What’s going on with you?” It turns out that Dan, the world-traveler, had never seen it before. After assuring him that this exotic delicacy could be found behind the deli counter in every supermarket in America, I convinced him to walk away from the bowl. As it turns out, I didn’t get a chance to make him his bowl of three-bean salad before he flew to Thailand. But last week, when I received a pound of wax beans and a pound of green beans in my CSA box, I knew the time had come to revisit this often-overlooked but delicious cookout favorite. Dan’s coming back to the States for his brother’s wedding in August. And although the batch I’ve made here won’t last until then, I’ve assured him that there will be three bean salad waiting for him upon his arrival stateside. I’ve made this bowl of salad with beans bought directly from the farmer, but it can be made with canned beans in the winter time; heaven knows that’s how they do it at the local grocery store. But right now I am loving the fresh version of this dish. Think of this recipe as a good point of departure. You can always add a can of chickpeas and make it a four bean salad. A green pepper, diced, would be great as well. Some chopped celery would also be excellent. 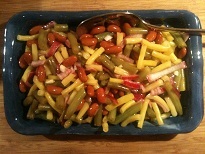 And sliced black olives… you get the picture. In a large bowl, combine the vinegar, oil, sugar and salt. Chop the onion and add that to the brine. Adding the onions to the brine at this early stage helps lessen their bite, so definitely do this step now. Trim the beans. I prefer the Cook’s Illustrated method of lining up the ends of a handful of beans on a cutting board and chopping off the heads with one cut, then doing the same to the other ends. By the time you’ve cleaned your two pounds of beans, your water should be boiling. Place the beans in the pot and set a timer for five minutes. While the beans are cooking, empty a tray of ice cubes into a bowl and fill it with cold water. When the five minutes have passed, quickly transfer the beans into the icy bath to blanch them. 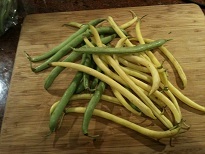 Once the beans have cooled off, grab them by the handful and roughly chop them into 1 to 2 inch pieces. 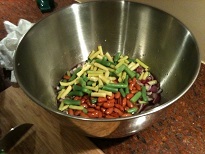 Add the chopped beans and the drained and rinsed kidney beans to the onions and brine. 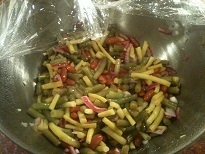 Marinate the bean salad for at least an hour. Longer is better; it will taste better in a day or two.